​The guest house is run entirely by solar energy, as being as eco-friendly as possible is of utmost importance to the place. It is requested to the guests to save as much solar energy as possible, for environmental reasons, and because Roland's Garden tries to offer its guests all the amenities, such as computers, wifi, fans, refrigerators, etc. Hot water is also produced by a solar installation and there is enough hot water to overcome the cloudy periods of 4 to 6 days. Another thing that makes Roland's Garden a "unique" place is that there is no road access, the access is only by a path that leads through the vegetation until it surrounds the garden. Your luggage will be taken to the guest house by the hotel's staff. For comfort and security the staff is available 24 hours 7 days a week, place is mainly run by the owner / manager. It is the right place if you are looking for family style accommodation run by friendly people that gives you the pleasure of living in a Caribbean island in a very peaceful and environmentally friendly setting with incredible views. 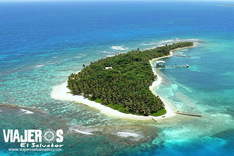 The island of Guanaja is the third of the archipelago known as Islas de la Bahia in Honduras, is characterized by its tranquility and privacy, its tropical environment, its coral reefs and crystal clear water, know more about the Island of Guanaja contacting us. ​Roland's Garden is a charming Bed & Breakfast located in the Port of Bight fruit of Guanaja. It's surrounded by greenery and tropical fruit trees, guests can enjoy breathtaking views of the forest and the Caribbean Sea. Breakfast is served in the balcony from where endemic Yello-neck parrots can be seen every day, flying through the fruit trees in the garden. It's a perfect island retreat and eco-adventure outpost! The purpose of the Pension is to offer a beautiful refuge, away from stress and civilization and still offering a great selection of activities and eco-adventures like Sea-Kayak, Hiking, Diving and Snorkeling to make the stay unforgettable. US $ 120 / night + Taxes Triple Bedroom (1 King + 1 Single), including breakfast for 3 and transfer to the airport. US $ 80 / night + taxes, a double room, including breakfast and transfer to the airport.